Count the number of ICBM launch vehicles. You may have heard that North Korea will be staging a major military parade this week in its capital, Pyongyang. The parade will come a day before the opening ceremony for the Pyeongchang Winter Olympics south of the demilitarized zone and show off recent advances in North Korea’s ballistic missile technology. The parade will be the first of its kind since North Korea’s ‘Day of the Sun’ parade last year on April 15, to commemorate the birth anniversary of Kim Il-sung, the country’s founder and current leader Kim Jong-un’s grandfather. We have a fairly good idea of the scale of the upcoming exercises, thanks to attentive analysis of commercial satellite imagery from the Mirim Parade Training Ground in Pyongyang. The participation of heavy military vehicles, including transporter-erector-launchers (TELs) for ballistic missiles, is probable. Last year’s parade was certainly remarkable and gave analysts of North Korea a lot more than they’d been expecting. The parade was the “coming out” event for the North’s submarine-launched ballistic missile (SLBM), the Pukguksong-1, which was paraded on trailers. The parade also introduced a range of new, indigenously developed integrated launcher vehicles with treads for off-road use. We saw these vehicles in use with the Pukguksong-2/KN15 solid-fuel, medium-range ballistic missile (MRBM), and the KN18 short-range ballistic missile, and the KN19 coastal defense cruise missile (CDCM), a new launcher configuration for a modified version of North Korea’s old Kh-35 anti-ship cruise missiles (ASCMs). The parade also showed off the then-unknown Hwasong-12 intermediate-range ballistic missiles, which, unknown to most analysts, had entered flight-testing in early April 2017, just a few weeks before it was paraded. The missile’s true capabilities and purpose would come to be known just a month later, when it was successfully flight-tested for the first time. 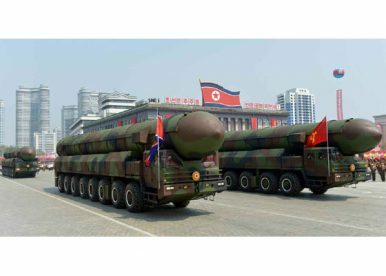 Finally, the parade last year led to a great crescendo when North Korea showed off two large canisters on a transporter-erector-launcher that appeared to be capable of accommodating intercontinental-range ballistic missiles (ICBM). Pyongyang, however, did not show us what would go inside those canisters. In any case, since last year’s parade, North Korea has shown off two brand new and significant missiles: the Hwasong-14 and the Hwasong-15 ICBMs were respectively flight tested for the first time in July and November 2017. There is a good chance that we may see units of these ICBMs paraded this year, a little more than one month after Kim Jong-un celebrated the completion of his nuclear forces during his New Year’s Day address. Most significantly, this parade will be an opportunity for the outside world to gauge whether North Korea has mastered the craft of creating its own heavy launch vehicles to carry, erect, and launch its new ballistic missiles. Ever since the older Hwasong-13 ICBM made its first appearance during a parade in 2013, we’ve seen as many as six integrated TELs capable of accommodating ICBM-sized missiles during parades. These vehicles—modified Chinese WS-51200 logging trucks—were confirmed to have been illicitly procured by North Korea from China by the United Nations Panel of Experts, which also said that at least six vehicles had been transferred. We know after North Korea’s November 2017 test of the Hwasong-15 that at least one of these vehicles was indigenously modified to a nine-axle variant to support to Hwasong-15, which is much longer than any previously seen North Korea ballistic missile. We know too that North Korea has claimed a significantly improved indigenous capability to manufacture heavy vehicles. For instance, in November 2017, three weeks before the launch of the Hwasong-15, Kim Jong-un visited the so-called March 16 Factory, where he observed the “production of Korean-style heavy-duty vehicles,” according to state-run newspaper Rodong Sinmun. In the ensuing weeks, Kim also visited the Kumsong Tractor Factory, the Amnokgang Tire Factory, and the Sungri Motor Complex. This week, he visited the Pyongyang Trolley Bus Factory. These facilities are each related to North Korea’s indigenous ability to produce various civilian and military-use vehicles. November’s Hwasong-15 launch, for instance, took place near the March 16 Factory—a sign that the TEL was modified at the site. All of this brings us to what will likely be the major takeaway from North Korea’s upcoming military parade, assuming strategic missile systems are on show: the TEL counts. If North Korea shows us anything more than six TELs capable of handling its new Hwasong-14 and Hwasong-15 ICBM—and I suspect it will—that’ll be an important moment. Any U.S. war-planning against North Korea will not only have to contend with the probability that its missiles successfully deliver their nuclear payloads to targets in Northeast Asia and the contiguous United States, but also how many launchers North Korea has. In an all-out preventive war scenario, Kim Jong-un has to be aware that he likely will get one—and just one—chance to launch as many ICBMs as he can at the United States. Re-loading North Korea’s converted Chinese logging truck TELs, therefore, won’t be an option. In order for North Korea’s ICBM force to serve as a useful and credible deterrent, not only will the missiles themselves need to be reliable, but they’ll have to be sufficiently distributed across the country on multiple launchers to be highly survivable. I don’t know what we’ll see at the upcoming parade, but one of the worse outcomes I can imagine is large convoy of ICBM-toting integrated launchers that are a new homemade design. Even without integrated launchers—where the missile rests atop a unitary heavy truck body—a new cab-and-trailer design would be worrisome. I suspect the North Koreans haven’t been bluffing on their ability to mass produce heavy trucks indigenously. Kim’s celebration of a complete nuclear force is really only true if he has the launchers necessary to enable North Korea to deploy the kind of nuclear force it wants. That’s why I think counting the ICBM TELs at this upcoming parade will be of great interest to Korea-watchers and the U.S. intelligence community alike. Moreover, with anticipated North Korean progression in large, solid fuel missiles with lighter airframes coming up, fully road-mobile canisterized weapons like the kind Kim Jong-un hinted at last year may become a reality too in the coming years. That’ll also require a mastery of indigenous heavy vehicle construction and I anticipate they’ll want to show that they’re well on their way to getting there. Of course, we may be in for other surprises. North Korea showed off plenty of new and previously unseen hardware at its parade last year; it may do so again. Remember, we’ve had a mysterious test of a new type of solid-fuel engine, a hint that a new SLBM called the Pukguksong-3 exists, and an improved variant of North Korea’s existing Scud-B missiles flight-tested (dubbed the KN21). There’s plenty we might see that’ll be of interest outside indigenous ICBM TELs. Either way, I’ll be watching the parade closely this week and offering my impressions here on The Diplomat.